The following suggestions may be helpful in preparing a job application in response to an advertisement (online or otherwise). Read the advertisement carefully, underlining or making notes on salient points raised - for example, the duties, the type of person sought and the method of application. If phoning is optional, it is generally preferable to phone initially, as they will often try to interview you over the telephone to reduce their workload, and save time by not bringing you in for a personal interview. This could give you the chance to sell yourself or at least find out vital information about the position. You will also find that the people on the other end may give you an immediate indication about your chances. You may possibly determine that the position is not what you wanted, thereby avoid wasting your precious time, effort and resources. You may be unsuccessful after submitting an application, but at least someone has got to read your letter first, before deciding to reject you for the position. 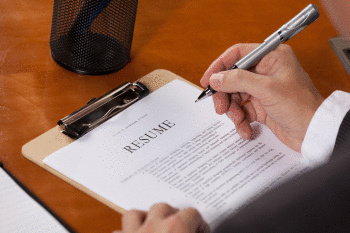 In writing the application letter to accompany your resume, highlight those aspects of your experience which the employer says they are seeking. One page should be sufficient and unless the advertisement specifically seeks a hand-written application, it should be typed. However, if it is hand-written, ensure your writing is neat and legible. Check spelling and grammar. Do not waste time writing lengthy application letters if you are asked to write or telephone for an application. Some consultants and organisations favour this approach, so you should be aware of a few basic guidelines. Judgments about people will be made on the way applications are completed. They will not be impressed by forms which are incomplete, difficult to read, inaccurate, vague, unconvincing or bearing signs of having been completed without attention or thought. If an online application form process is being used try to complete it within a couple of days. Read thoroughly all of the notes on the application form and make sure you understand what is required. Put the right information in the right sections. Use every space on the form effectively; a neat layout creates a good impression. Draft answers to questions where personal views or long narratives are called for and then cut and paste the final wording into the form (when you are satisfied with it). Be brief and succinct with your responses.